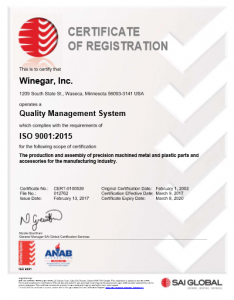 Winegar, Inc is pleased to announce that we have been audited to meet the new ISO 9001-2015 standard. The new designation was effective as of March 09, 2017. This was an extensive, in depth review of our quality systems, and procedures. We are proud of the concern for quality that is shown by our team, and shown in the workmanship of the product we produce. This entry was posted in News by Treacyann. Bookmark the permalink.